Nicholas Alexander Barnett (born May 27, 1981) is a former American football linebacker. He played college football for Oregon State University, and was drafted by the Green Bay Packers in the first round of the 2003 NFL Draft. He has played professionally for the NFL's Green Bay Packers, Buffalo Bills and Washington Redskins. With the Packers, he won Super Bowl XLV against the Pittsburgh Steelers. Barnett was born in Barstow, California and attended Fontana A.B. Miller High School in Fontana, California. Barnett attended Oregon State University, where he was a four-year letter winner for the Oregon State Beavers football team (1999–2002), starting the last three seasons at strong side linebacker. As a senior, Barnett was a first-team All-Pacific-10 Conference selection. He led the conference in tackles with 121 (62 solo). Barnett registered his single game best against the University of California in 2001 with 18 tackles (11 solo). He majored in Business Administration and Communications. Nick Barnett and Charles Woodson at Lambeau Field. Barnett was drafted by the Green Bay Packers in the first round of the 2003 NFL Draft. On April 10, 2007, Barnett signed a six-year contract extension worth $34.85 million. Barnett missed the second half of the 2008 season after suffering a torn knee ligament during November 9's game against the Minnesota Vikings. Barnett suffered a season-ending wrist injury in a Week 4 matchup vs. the Detroit Lions. He was put on injured reserve on October 7, 2010. It was the second time in three seasons that Barnett ended his season on injured reserve. 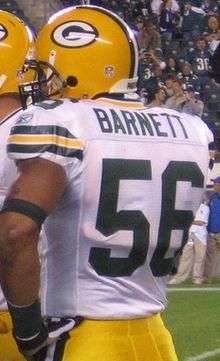 Barnett is second in all-time tackles for the Green Bay Packers. On July 26, 2011, Barnett was informed by Packers General Manager, Ted Thompson, that the Packers will try to trade him, but if not, they will release him. He was released on July 28, after Green Bay was unable to find a trade. Barnett signed a three-year, $12 million deal with the Buffalo Bills on July 31, 2011. On February 11, 2013 the Bills announced that Barnett would be released from his contract along with safety George Wilson. On July 31, 2013, Barnett agreed to a one-year deal with the Washington Redskins. He switched from the outside to inside linebacker position for the Redskins' defensive scheme. On December 24, he was placed on injured reserve after suffering a MCL sprain in the Week 16 game against the Dallas Cowboys. ↑ "Nick Barnett walks away from pack". oberjuege.com. Retrieved April 13, 2015. ↑ "Nick Barnett Pre Draft Bio". Seahawks.com. March 28, 2008. ↑ "Deal worth $34.85 million". Milwaukee Journal-Sentinel Online. April 11, 2007. ↑ "Torn knee ligament to sideline Barnett for rest of season". www.espn.com. November 10, 2008. ↑ "Sources: Green Bay Packers linebacker Nick Barnett out for season". ESPN.com. ↑ "Packers Return to Lambeau Field but Nick Barnett Departs". WBAY. Archived from the original on September 28, 2011. ↑ Jones, Mike (August 1, 2013). "Nick Barnett ready to compete, help Redskins build on last season's success". WashingtonPost.com. Retrieved 2013-08-07. ↑ Tinsman, Brian (December 24, 2013). "Nick Barnett Done For The Season". Redskins.com. Retrieved 2013-12-26. Wikimedia Commons has media related to Nick Barnett.